The overall goal of this project is to provide a detailed understanding of the human humoral response to Norovirus (NoV) infection and to define the molecular and structural basis for inhibition of NoV by human antibodies. NoV is the leading cause of sporadic and epidemic gastroenteritis in humans. There are currently no vaccines, therapeutics, or prophylactics available to prevent or treat NoV infection. Vaccine design also has been difficult due to the antigenic variation within and between NoV genogroups. 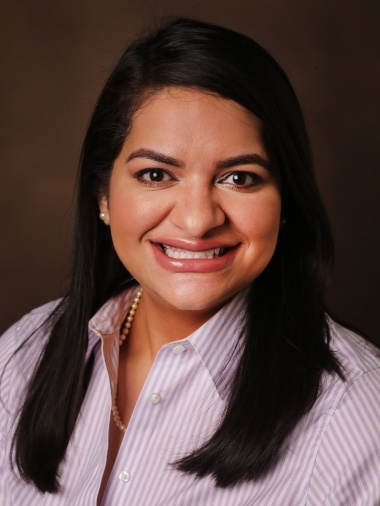 To design a vaccine that elicits broad protective immunity, we must have a solid understanding of the NoV-mediated human antibody response to infection and antigenic sites recognized by these antibodies, so a critical area of HuNoV research has become the identification of type specific and cross-genotype and genogroup epitopes. The general hypothesis of this study is that inter- and intragenogroup I and II cross-reactive broadly blocking human antibodies exist and that the blocking function of such antibodies is principally mediated by IgA isotype molecules. The approach to this project will include high-efficiency isolation of human mAbs from patients previously infected with GI and GII strains of human NoV. I then will use this panel of human antibodies to determine if antibody isotype influences binding to NoV virus-like particles (VLPs) and blocking of binding of VLPs to host attachment factors. Finally, using site-directed mutagenesis and three-dimensional structural analysis, I will map immunoreactive epitopes on current circulating strains of NoV and determine whether cross-reactive broadly blocking epitopes exist. As was done below for Norwalk virus, we intend to characterize three-dimensionally where broadly binding and blocking human monoclonal antibodies bind to current circulating strains of norovirus. Cross-reactive inter- and intra-genogroup murine Abs to several strains of NoV have been previously isolated by other groups, but the blocking abilities of these Abs were never tested. A murine Ab response to a human infection offers little information about the actual human response. Furthermore, antigenic blockade epitopes on GII.4 Sydney, GII.6, GII.17, GII.3, or GI.2 NoV strains have yet to be identified. My next main objective is to isolate cross-reactive human broadly blocking monoclonal antibodies to GI.1, GI.2, GI.3, GII.3, GII.4, GII.6, GII.13 and GII.17 and to map their corresponding epitopes. The information we gather also will be useful when reformulating multivalent VLPs for HuNoV vaccine trials, since the goal of a vaccine is to elicit a protective response against more than one circulating strain of HuNoV. 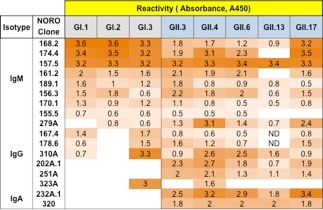 Below is a table with 17 of the cross-reactive human we have isolated as well as their reactivity to all 8 VLPs, with a higher absorbance value being shaded in the darker orange and lower absorbance values in the lightest orange. 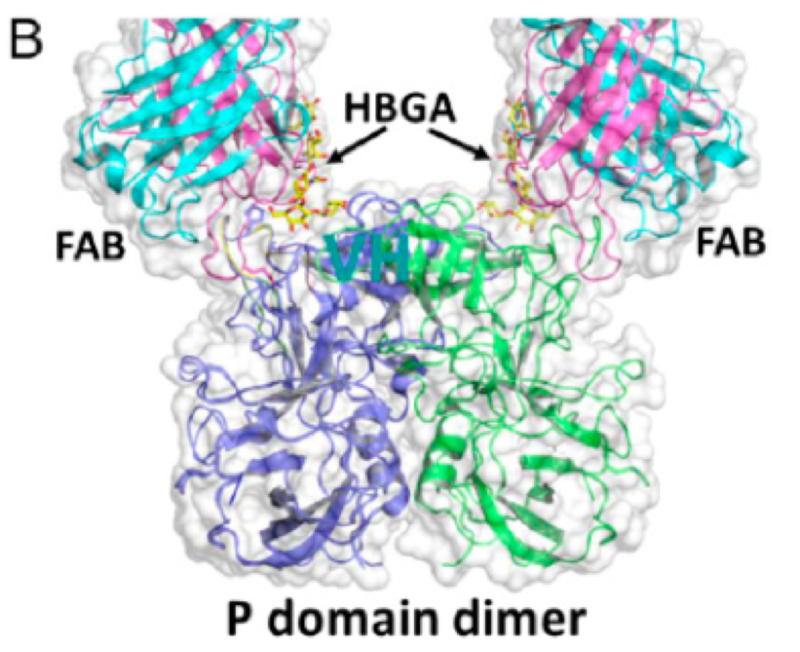 I hypothesize that human antibodies isolated will bind to the protruding (P) subdomain of the circulating strains, similar to the findings for cross-reactive murine Abs. The P domain has more surface exposure on a live virion and should therefore be more accessible than the shell (S) subdomain. I will also provide thorough blockade analysis of all isolated and analyzed mAbs. All binding and blockade epitopes defined would be the majority of these strains. Binding and blocking data will be averaged for at least 3 assays. I expect IgAs and IgMs to play a dominant role in blockade function because of their importance in gut and mucosal immunity. Our studies will provide a thorough analysis of the nature of cross-reactive human anti-NoV mAbs. To validate blockade function of GI.1, GII.3, GII.4, and GII.17 specific mAbs, I will work with our collaborator Dr. Mary Estes to test reduction of replication of live virus using human intestinal enteroids (HIE). Unfortunately, GI.2, GI.3, GII.6 and GII.13 cannot be tested using the HIE system because they have yet to be grown robustly in vitro, so I will test their function using a surrogate neutralization assay. The use of a HIE for HuNoV replication is novel, and therefore will only be used to validate trends noted while using a surrogate neutralization system. Serum neutralization studies using HIE have been completed by Dr. Estes’ lab, so I do not expect any complications in this area. Their studies also suggest that virus neutralization using HIEs is a more sensitive assay than the HBGA assay, so I expect to see high neutralizing values even for low blockers. The Octet biosensor system can be used to measure Ab affinity characterization or to compete antibodies against each other to identify potential the number of potential epitopes. Both competition-binding studies and the use of different antigens presenting different subdomains for each strain will narrow down binding epitopes. Site-directed mutagenesis, combined with alanine scanning mutagenesis, can be used to substitute specific amino acids in potential epitopes with alanine. Use of alanine will eliminate the side chain beyond the β-carbon and should not alter main-chain conformation. This approach will define at the amino acid level which residues are critical for binding and will define antibody-binding epitopes. As an alternative approach, I can use X-ray crystallography to map pertinent epitopes. This information will be valuable when designing broadly cross-reactive vaccines and therapeutics for current circulating strains of HuNoV. Sapparapu, G.*, Czakó, R.*, Alvarado, G.*, Shanker, S., Prasad, B.V.V., Atmar, R., Estes, M., Crowe, J. Jr. (2016). Frequent use of the IgA isotype in human B cells encoding potent norovirus-specific monoclonal antibodies that block HBGA binding. PLoS Pathog. 2016 Jun 29. Doing:10.1371/journal.ppat.1005719. eCollection 2016. Primary: James E. Crowe, Jr.